MPC in the coastal fog. 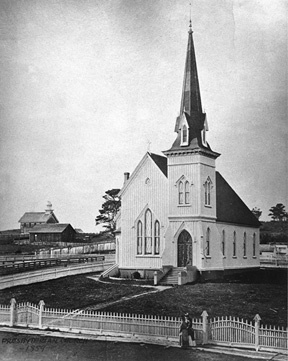 The present Sanctuary, started on October 7, 1867, was built of local redwood for a cost of $10,000. Half of this sum, as well as the land the church was built on, was donated by Jerome B. Ford. 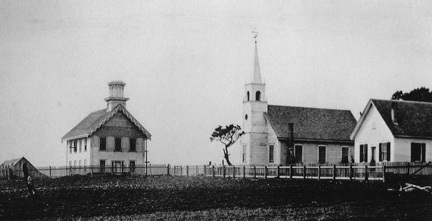 The new building was dedicated on July 5, 1868, with a sermon preached by the Reverend Dr. Laurentine Hamilton (for whom Mt. Hamilton is named), pastor of First Presbyterian Church of Oakland. Architects S.C. Bugbee and Son of San Francisco designed the English Gothic edifice that faced the ocean on the Old Coast Road coming up from the river flats. This thoroughfare has now passed from use, but when the church was built, it was the main entrance from Big River crossing into town. That is why the church now seems to turn its back on Main Street. The Eidsath House: Former manse and current offices. A manse was built in 1909, extensively modernized and restored in 1966, and again in 1987 so that it is a repository of many choice mementos of early Mendocino, attractively renewed in authentic manner. The pastor no longer resides in the manse; the building, rededicated as Eidsath House, now serves as administrative offices and additional meeting rooms. On May 5, 1957, Preston Hall was dedicated to the service of God. 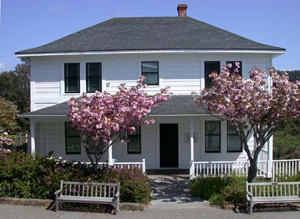 Dr. Russell W. Preston, Mendocino’s early and beloved physician, gave his own home and other property as an initial bequest to provide funds for a multipurpose building for the church and the community. In 1974, upon pay-off of the mortgage, the congregation held a joyful, thankful mortgage burning ceremony. It was often heavy going for a small congregation. Harmony did not always prevail . . . one account tells of a confrontation in which the President of the Board of Trustees punched the pastor in the nose! Rugged pioneer personalities sometimes clashed; at one point a schism split the congregation and it declined to the point where the Presbytery considered dissolving it. There were periods of progress, too, with new pastors, and new members bringing fresh enthusiasm and purpose. The troubled sixties brought new crises and new challenges. Civil rights issues, war, youth rebellion, and the drug scene all affected the congregation. There were sharp differences, and some members left. But for the most part, the congregation, Session, and successive ministers elected to pursue a course of reconciliation, compassion, and healing, opening the doors of the old building to all who would come and extending its outreach by example. The church has already observed three centennials. 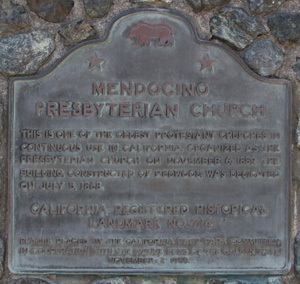 The first in 1954, celebrated the 100th birthday of Protestant services in Mendocino Village. The second, in 1959, took note of the first 100 years as a Presbyterian congregation. At that time, the church was declared a California Historical Landmark, #714; a bronze plaque on Main Street affirms this designation. The church is also listed in the Federal Registry of Historic Places. The third centennial in 1967 marked the first 100 years of the life of the building itself. California State Historic Marker, placed in 1959. The interior of the sanctuary has been altered many times over the years – pews added and subtracted – to satisfy the changing needs of the congregation. Small rooms obscuring the first windows at each side of the chancel were cut back in 1978, providing space for the choir on the left. The original balcony at the rear had been modified since the turn of the century by a two-story fellowship hall, a kitchen and a parlor upstairs, and two Sunday school rooms below. After Preston Hall was built, this enclosure was removed and the balcony restored to its original configuration. The original chandelier and sconces on the sides, with their oil lamps, have been gilded and electrified. Welcomed throughout the year, visitors who have been impressed with the life and outreach housed in this venerable building have contributed donations to share in its projects. Dedicated members tithe, not only money, but also their time, talents, and labor. Memorial stained glass windows in the narthex and chancel were designed and executed by church member Leone McNeil Zimmer, a local artist, in the late 1970s and 1980s. The large windows in the rear of the church were blown out in the 1952 hurricane. A newly designed memorial stained glass window, also by Leone McNeil Zimmer, replacing an interim window, was dedicated on August 12, 1990. In 1996, the beauty of the church was enhanced with a new courtyard and memorial gardens designed by George Storz and made possible by generous gifts from members and friends, including Aline Ford Pierce, granddaughter of Jerome B. Ford. Today, as in its beginning, the congregation is a mix of those who, finding no church of their own denomination here, have entered into fellowship with Presbyterians. Old and young have found within this church a joyous combining of friendship, love and service. From its original eight charter members, it has grown to a membership of over 150. Rare and precious, this oldest of California’s active Presbyterian churches is still vigorous and young, even after all these years. 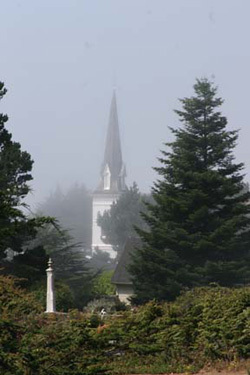 Much more than a historical landmark or museum, the Mendocino Presbyterian Church continues to serve the congregation and the community under the leadership of our pastor assisted by elders and deacons in charge of various ministries. Children and youth are welcome as part of God’s family. Intergenerational classes and fellowship activities help build a sense of connection between young and old. Special events, camp experiences and mission trips are planned throughout the year. There are many opportunities for Bible study, prayer and fellowship for adults during the week at Eidsath House, Preston Hall or in various homes. The Rainbow School, operated on the church campus, started in 1978 as an opportunity for church families to give their children a preschool experience with a strong spiritual emphasis. 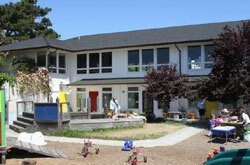 It is a licensed childcare facility serving over 45 families. Allied ministries include Mendocino Christian Camp; Seeds of Learning, a program helping to build schools, and to provide school equipment and literacy programs in rural Nicaragua; and The Woods, a retirement community in Little River administered by Northern California Presbyterian Homes. Preston Hall provides space for non-profit organizations and community-based support groups to hold meetings, meals, concerts and other special events. The sanctuary is used for regular worship services every Sunday and for holiday celebrations. The sanctuary is frequently the site chosen by members and visitors for weddings and memorial services.